Move each vertex. How many different quadrilaterals can you form? Click the arrow on the folder and investigate the table and the moveable point. Resave the file and call it "Create Polygons". Below are the expressions and table to add to the 3-Sides (Triangles) folder. Add similar expressions and table to add to the folder for pentagons. A moveable point must start and end the table to connect the sides of the figure. Hold the circle until the menu shows. Select the icon to connect the points and to move them in all directions. The variables MUST be unique. Choose a system that makes sense to you. In this case the columns are named P3x and P3y representing the x-column for a polygon of 3 sides and the y-column for a polygon of 3 sides. The variable point was named: (x3,y3) for a variable point for the 3-sided figure. 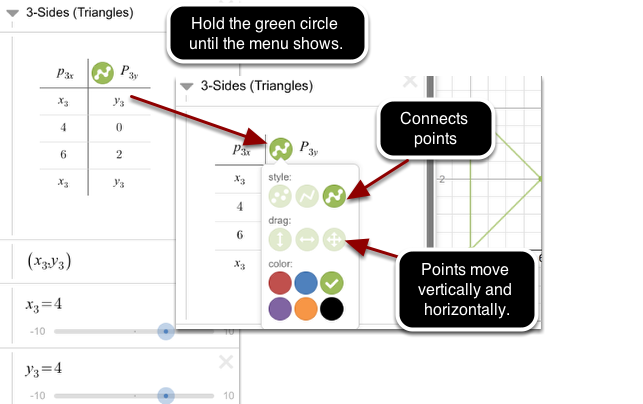 Check how the variables are named for the 4-sided polygon. Follow a similar pattern for the 5-sided polygon. 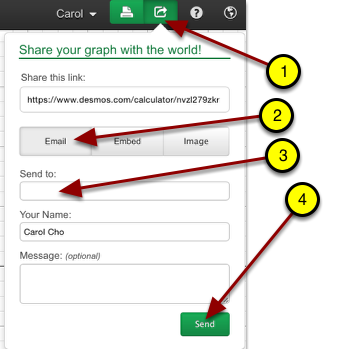 Save your work in your Desmos Account. Save the link to your google spreadsheet for your partner to access or email the link to your partner.